Born in Miami, Arizona (Class of 1944), Mary attended the University of Arizona (Class of 1948) where she lettered in field hockey. After a series of teaching stints at various colleges in the West, Mary came back to the UA in 1959 and was hired as Director of the Women’s Recreation Association. Through the years she coached gymnastics and field hockey and worked to establish the Association of Intercollegiate Athletics for Women (AIAW). In 1972, the year in which Title IX, the Federal Law mandating that female athletes receive equal rights on the playing field, Mary was hired as the first (and only) Director of Women’s Athletics at the University of Arizona. Men’s and women’s athletics were merged in 1975, though each department had its own director for another seven years. 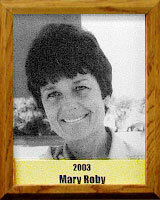 One of Dr. Roby’s significant accomplishments was the hiring of top-notch male coaches for her women’s teams. This breakthrough trend would result in the hiring of such notables as Jim Gault in gymnastics, Mike Candrea in softball, Dave Murray in track and Frank Busch in swimming. Mary continued to grow the women’s sports program at the UA as it left the AIAW to join the NCAA in 1982 and as it joined the Pacific-10 Conference in 1986. By the time she retired in 1989, Dr. Roby had achieved a national reputation and the UA women were being recognized as one of the ten most successful women’s programs in America.